Staining DNA molecules for fluorescence microscopy allows a scientist to view them during an experiment. In the method presented here, DNA molecules are pre-stained with fluorescent dyes and digested with methylation and non-methylation sensitive restriction enzymes. Maschmann, A., Masters, C., Davison, M., Lallman, J., Thompson, D., Kounovsky-Shafer, K. L. Determining if DNA Stained with a Cyanine Dye Can Be Digested with Restriction Enzymes. J. Vis. Exp. (132), e57141, doi:10.3791/57141 (2018). Visualization of DNA for fluorescence microscopy utilizes a variety of dyes such as cyanine dyes. These dyes are utilized due to their high affinity and sensitivity for DNA. In order to determine if the DNA molecules are full length after the completion of the experiment, a method is required to determine if the stained molecules are full length by digesting DNA with restriction enzymes. However, stained DNA may inhibit the enzymes, so a method is needed to determine what enzymes one could use for fluorochrome stained DNA. In this method, DNA is stained with a cyanine dye overnight to allow the dye and DNA to equilibrate. Next, stained DNA is digested with a restriction enzyme, loaded into a gel and electrophoresed. The experimental DNA digest bands are compared to an in silico digest to determine the restriction enzyme activity. If there is the same number of bands as expected, then the reaction is complete. More bands than expected indicate partial digestion and less bands indicate incomplete digestion. The advantage of this method is its simplicity and it uses equipment that a scientist would need for a restriction enzyme assay and gel electrophoresis. A limitation of this method is that the enzymes available to most scientists are commercially available enzymes; however, any restriction enzymes could be used. The TOTO series (TOTO-1, YOYO-1, POPO-1, BOBO-1, TOTO-3, YOYO-3, POPO-3, and BOBO-3; Table 1) is utilized in a wide variety of experiments where the visualization of DNA is required1,2,3,4,5,6,7,8,9,10,11,12,13,14,15,16,17. The cyanine dimer family is widely used due to their quantum yield, sensitivity, and high affinity for DNA molecules18,19,20. Cyanine dimer dyes have great selectivity for double stranded DNA and when intercalated have a 100 to 1000 fold increase of fluorescence21. Pyridinium dyes (YOYO-1, TOTO-1, YOYO-3, and TOTO-3) have a shorter emission wavelength than their quinolium dye (BOBO-1, POPO-1, BOBO-3, and POPO-3) counterparts (Table 1)22. Also, the quantum yield for cyanine dimers intercalated into DNA is high (0.2 - 0.6)22. However, using an enzyme to determine the methylation profile of a DNA molecule2 or stretch23 of a DNA molecule already stained with fluorescent dye requires a method to determine what enzymes will digest stained DNA. Any type of dye that intercalates into DNA or any enzyme that gives a discernable pattern of the DNA substrate can be used for this method. Meng et al. first determined the digestion rate of prestained DNA through gel electrophoresis using a variety of different dyes24. Maschmann et al. delved in deeper to look at the TOTO family of dyes. Both determined the digestion rate of stained DNA to see if DNA stained with a given dye could be digested with a restriction enzyme25. Other methods study binding effects of dyes intercalated with DNA using optical tweezers26 or NMR27. Either method requires specialized equipment; whereas, this method allows equipment that most molecular biology labs have to determine if a dye interferes with a restriction enzyme digestion. Additionally, in other methods to measure the length of a given molecule, optical mapping has elongated unstained DNA molecules on a surface and digested DNA to determine the stretch and size of fragments. Intercalation of dye has been shown to increase the contour length of fluorescently stained DNA molecules and depending on the dye used, the contour lengths are different21. This method has been utilized in a variety of genomes1,3,4,6,13,28,29,30,31. However, if molecules were pre-stained, depending on the dye and enzyme, the enzyme may not be able to cut DNA stained with a given dye. Therefore, this method determines if DNA stained with a given dye can be digested with an enzyme. Additionally, depending on the concentration of the dye and the dye utilized, the mobility of the DNA bands in a gel will migrate more slowly than native DNA due to the partial unwinding of the DNA backbone to make room for the dye to insert between base pairs32. However, sometimes these dyes can partially or completely inhibit the action of certain restriction enzymes7,24. This is thought to be due to a structural change in DNA caused by the attachment of the fluorescent dye, which may prevent the enzyme from recognizing its specific sequence. Understanding how these dyes affect restriction enzymes can help in experiments where the methylation profile or the stretch of stained DNA is required. In our method, DNA was stained with a fluorochrome of interest and digested with a restriction enzyme. Then DNA was electrophoresed on a gel, imaged, and the restriction enzyme digestion rate was measured. The restriction enzymes were chosen based on the cut pattern on a gel. Too many bands caused overlap of DNA bands and too few bands did not give a complete picture of the DNA molecule. There is a sweet spot to be able to determine the profile of the digested DNA molecule; therefore, it will depend on the DNA used and the enzyme. An advantage of this method is its simplicity; it only requires equipment used in a restriction digestion and gel electrophoresis. Prepare the following solutions for staining DNA or the digestion of stained DNA. Prepare 1x TE (Tris-HCl and ethylenediaminetetraacetic acid; EDTA) buffer using 10 mM Tris-HCl and 1 mM EDTA in a graduated cylinder or volumetric flask. Store at room temperature (18 - 25 °C). Make aliquots of each dye: TOTO-1, YOYO-1, POPO-1, BOBO-1, TOTO-3, YOYO-3, POPO-3, BOBO-3 (Table 1). Pipette 4 µL of 1 mM dye into a dark amber or black 1.5 mL tube and add 36 µL of 1x TE, mix using the pipette; this concentration makes a 100 µM dye solution (40 µL total). Complete this step for each dye. Store at 4 °C. NOTE: Avoid exposing dye to light to prevent photobleaching or degradation of the dye. Prepare buffer 1 using 10 mM Bis-Tris-Propane-HCl, 10 mM MgCl2, and 100 µg/mL bovine serum albumin (BSA). Prepare buffer 2 using 50 mM NaCl, 10 mM Tris-HCl, 10 mM MgCl2, and 100 µg/mL BSA. Prepare buffer 3 using 50 mM Potassium Acetate, 20 mM Tris-acetate, 10 mM magnesium acetate, and 100 µg/mL BSA. Each enzyme will require one of these specific buffers to function. Prepare the following solutions for gel electrophoresis. Make a 6x loading dye by combining 0.25% bromophenol blue, 0.25% xylene cyanol, 15% Ficoll in dH2O. Store at room temperature. To make a 0.7% agarose gel, weigh out 0.07 g of high gelling temperature (HGT) agarose in an Erlenmeyer flask, add 100 mL of 1x TAE buffer and place an inverted beaker on top of the flask. Heat the solution on a hot plate until bubbles begin to form on the bottom of the flask and float to the top. Remove the solution from the hot plate, let the solution cool until the flask can be touched with a bare hand, and then pour the gel into a 24.5 cm x 21.8 cm gel mold with a gel comb to create wells. Remove bubbles near the comb or on the surface of the gel by popping them with a pipette tip and allow the gel to solidify for at least 15 minutes. This can be stored in a fridge (4 °C) wrapped in plastic wrap for 1 week to prevent drying of the gel or contamination. For more information on how to run a gel refer to Lee et al.33. NOTE: Use a gel comb with 30 individual wells. Each well should be 4.5 mm wide with a depth of 2 mm. The height of the well will depend on the amount of gel poured into the box. Prepare 1x TAE (Tris - acetate - EDTA) buffer using 40 mM Tris-HCl, 20 mM acetic acid, and 1 mM EDTA. Store at room temperature (18 - 25 °C). Stain lambda DNA (300-800 ng) using different aliquots of dyes. Each dye (Table 1) will have six different concentrations tested, for a total of 48 reactions per restriction enzyme. The following process outlines a set up for 1 reaction (Figure 1). Dilute lambda DNA using 1x TE to 100 ng/µL. Store in 4 °C. Make a solution with total volume of 300 µL. Stain unmethylated lambda DNA. For each band expected from the digest, estimate 75 - 100 ng/band. Add appropriate amounts of dye to produce concentrations of 1.9 µM, 3.8 µM, 19.4 µM, 32.2 µM, 48.3 µM, 63.5 µM / 100 ng of DNA. Incubate overnight (15 h - 18 h) at 4 °C. Leave one reaction unstained to act as a control25. NOTE: Use unmethylated DNA for the digestion reaction. Methylation sensitive enzymes cannot cut methylated regions in DNA and will give an appearance of an incomplete digestion. Digest stained DNA with a restriction enzyme to determine if that enzyme can digest prestained DNA (Figure 1). The following day, add 20 U of restriction enzyme, 3 µL of the appropriate buffer ( Table 2), and distilled, autoclaved and filtered water for a total of 30 µL. For each enzyme reaction, choose the buffer with the highest cutting efficiency, which can be found on the manufacturer's website. Place the reactions in a water bath at the temperature of optimal enzymatic activity, listed in Table 2 for the 6 enzymes used in Maschmann et al., for 2 - 4 h (Table 2)25. Stop the reaction by adding 2 µL of 0.5 M EDTA pH 8.0. Remove the sides from the 24.5 cm x 21.8 cm gel mold (Step 1.2.2) and place the gel into the gel electrophoresis box. Pour 2.5 L of 1x TAE buffer into the box. Carefully remove the gel comb from the gel, so the wells are accessible33. Pipette the restriction enzyme reactions onto a plastic film and combine each reaction with 6x loading dye. For each reaction solution, add 1 µL of 6x loading dye per 5 - 6 µL of DNA solution (1x). Then pipette the reactions (containing the loading dye, <18 µL) into the wells. Mix 1 µL of 1 kb ladder, 9 µL of 1x TE, and 2 µL of 6x loading dye. Load solution into the wells that flank the other solutions. Cover the gel box with dark blue or black paper or fabric. Connect the gel box to a power supply, set the power supply to 30 V, and run it overnight (15 - 20 h). Turn off the lights while the gel is running, to prevent photocleavage of the labeled DNA. The next morning turn off the power supply. Take the gel out using the tray and transfer it to a container with 45 µL ethidium bromide and 1 L of 1x TAE buffer. Store the container at room temperature in the dark or cover in foil to prevent exposure to light. Let gel stain for at least 45 min at room temperature. CAUTION: Use ethidium bromide with gloves and wear safety glasses. When cleaning out the container containing ethidium bromide solution and throwing away the gel, consult your states disposal guidelines to determine how to deal with used ethidium bromide; additionally, other stains may be utilized instead of ethidium bromide. Place the gel on top of a blue light transilluminator, which emits maximum light output between 400-500 nm. Take pictures with the camera attached to the station. CAUTION: Make sure to use the cover for the illuminator and put on protective glasses prior to turning on the light source. NOTE: This step may also be completed using any UV light source or standard gel scanner. View the pictures in ImageJ by dragging the file to the ImageJ status bar and the image will pop up. Determine the digestion rate for the experiment by comparing the bands on the gel to the expected in silico gel pattern. To determine the digestion rate, the number of experimental bands is divided by the expected number of DNA bands24,25. If the experimental digested DNA band pattern has the expected pattern, the digestion rate is 1. If the pattern has more fragments than expected, the digestion rate is greater than 1. If the pattern has less fragments than expected, the digestion rate is less than one. In order to determine if an intercalating dye will affect a restriction enzyme digesting DNA, the correct order of steps must be followed (Figure 1). Once DNA is stained and digested with a given enzyme, a picture of the gel can be taken to determine the number of fragments and their size (Figure 2). In order to determine the enzyme efficiency, the total number of expected visible bands divided by the number of visible bands. Enzyme efficiency equaled unity, if the number of bands expected and seen match. If there are more bands on the gel then expected, the value is greater than one and indicates partially digested reactions. If there are less bands then expected, then the value is less than one, which indicates incomplete digestion. In Figure 2a, lanes 3 and 4 show the mobility of the bands has decreased, causing the bands to shift towards the wells. In lanes 1 and 2, the amount of dye does not affect the mobility noticeably, so the bands match the control. In Figure 2a, lanes 5 and 6 show more bands than the control, so it indicates partial digestion. Which means, the dyes affected the cleavage of the DNA at the recognition site for that enzyme. In Figure 2b, all expected bands are seen for all dye concentrations, so the dye did not interfere with the digestion of DNA. Figure 2c tracks the mobility shifts with colored asterisks. As dye concentration increases for dyes with -1, the mobility decreases. In order to determine the approximate size of the bands, a control is required to know where the native DNA molecules are expected compared to the stained DNA (Figure 2a). For dyes with -3, the mobility did not decrease to the extent that -1 dyes did, so it was easier to determine the fragment size (Figure 2b). The mobility difference is due to the type of dye utilized, as seen in Maschmann et al.25.The variance of these dyes is seen due to the structures of the dyes. The linker between the aromatic moiety for dyes -3 was longer than -1. The dyes may intercalate slightly differently due to the difference in the linker size, which may explain why the mobility shift is less for -3 dyes. If there is no DNA, or the DNA bands are very faint in the gel, increasing the concentration of DNA is required. However, if the DNA concentration increases, then the amount of dye required will also increase to keep the correct concentration of dye to DNA ratio. Figure 1: A schematic of the steps required when digesting fluorochrome labeled DNA molecules. DNA and YOYO-1, or another dye from the TOTO series, is added to a black tube and incubated overnight (O/N; 15 - 20 h). A restriction enzyme is added to a tube; it is placed in an incubator, at the preferred temperature, for 2 - 4 h (Table 2). Load samples into an immersed 0.7% agarose gel made with 1x TAE buffer. Dark colored paper covers the gel box and the lights are turned off, while the gel is ran overnight to prevent photocleavage of the dye. Please click here to view a larger version of this figure. Figure 2: Restriction digestion of DNA intercalated with a cyanine dimer dye. 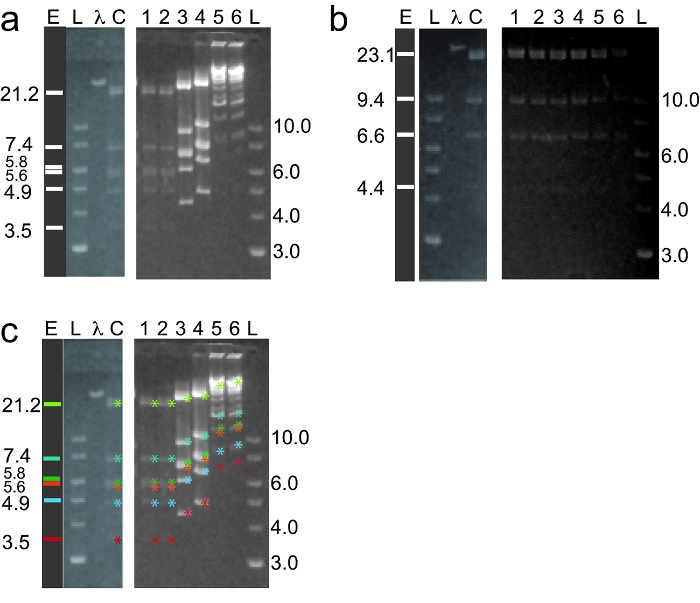 (a) Lambda DNA is stained with different concentrations of YOYO-1 overnight (lane C: digested lambda DNA with no dye (control), lane 1: 1.9 ng, lane 2: 3.8 ng, lane 3: 19.4 ng, lane 4: 32.2 ng, lane 5: 48.3 ng, lane 6: 63.5 ng of dye per 100 ng of DNA) and then digested with EcoRI at 37 °C for 2 - 4 h. All reactions are electrophoresed (E = 0.85 V/cm) on a 0.7% high gelling temperature (HGT) agarose gel made with 1x TAE buffer (1x TAE; 40 mM Tris-HCl, 20 mM Acetic acid, 1 mM EDTA). Gels are stained with ethidium bromide and imaged with a blue light transilluminator coupled to a camera. Lane L is a 1 kb ladder (sizes, kb); lane λ is full length lambda DNA; lane E is the expected band pattern (sizes, kb). (b) Lambda DNA is stained with YOYO-3 (lane 1: 1.9 ng, lane 2: 3.8 ng, lane 3: 19.4 ng, lane 4: 32.2 ng, lane 5: 48.3 ng, lane 6: 63.5 ng of dye per 100 ng of DNA) and digested with HindIII at 37 °C. (c) To see how the mobility shifted as the YOYO-1 concentration is increased, colored asterisks are located next to each band for each YOYO-1 concentration. For example, the band at 3.5 kb has a red asterisk next to each band in each YOYO-1 concentration. The unexpected bands in lane 5 and 6 do not have an asterisk next to the bands. The figure is modified from Maschmann et al.25. Copyright (2017) Nucleosides, Nucleotides, and Nucleic Acids. Please click here to view a larger version of this figure. Table 1: Abbreviated names of TOTO family of dyes with IUPAC names with emission (Em) and excitation (Ex) maximima22. Table 2: Listed in the table is a subset of possible enzymes that could be used in these experiments. Three enzymes are methylation sensitive and three are not methylation sensitive. The buffers used for the enzymes and incubation temperatures are listed for each enzyme. In order to digest fluorescently labeled DNA (Figure 1), a series of steps are required. First, DNA is stained with a fluorochrome overnight. DNA can be incubated with cyanine dimers for a shorter period of time; however, Carlsson et al. found that DNA created double bands for each DNA size due to incomplete staining20. To remedy this, the DNA can be stained overnight to prevent double bands from occurring. This is a critical step in the protocol. If the dye is not incubated for a long enough time, the dye-DNA may not be at equilibrium and will give a double-banding pattern. If this does occur, allow the DNA-dye mixture to equilibrate for a longer period of time. Next, a restriction enzyme is added to the DNA-dye mixture and digested for 2 - 4 h at a specific temperature for each enzyme. The DNA must be unmethylated for methylation sensitive enzymes. If it is not, methylated DNA will inhibit the restriction enzyme from cutting DNA in methylated regions. Additionally, the reaction must be incubated in the correct buffer and temperature for the enzyme. Each enzyme has a list of buffers and the enzyme activity in each buffer. Choose the buffer with enzyme activity at 100%, if possible. As for temperature, make sure it is incubated in the correct temperature. If it is not, it may cause the enzyme to lose activity or denature if the temperature is too high. EDTA is utilized to stop the reaction. The company where the enzymes were purchased will have a chart with the optimal temperatures and buffer conditions for that enzyme. If the control does not give the correct number of bands at the right molecular weights, check to see if the enzyme is expired, increase the incubation time, or check to make sure the temperature is correct for that enzyme. Once the reaction is completed, the samples can be loaded into a gel. First, a gel is loaded into the gel container and immersed in 1x TAE buffer. Next, the digested DNA is mixed with loading dye and the solution is loaded into the wells of the gel. The lid is slid over and the wires are attached to the gel box. A dark paper, that is taped together, is placed on top of the lid to cover the lid and drape over the sides. 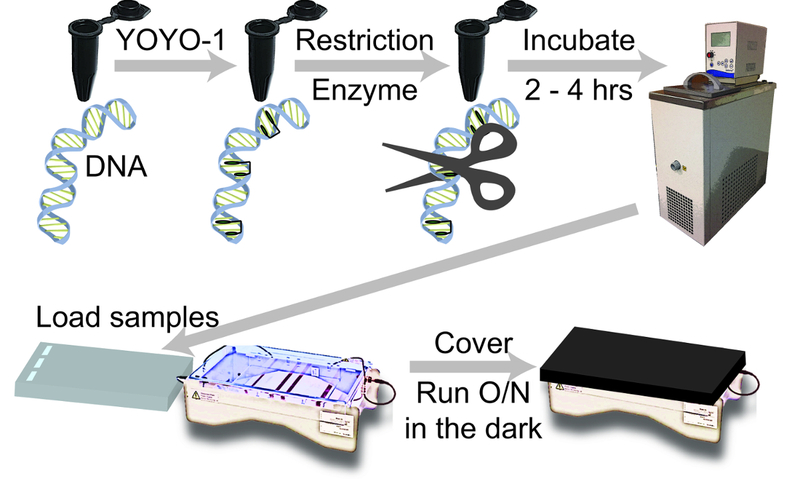 Another critical step is that the samples are protected from the light at all times, especially while the gel is running. The power supply should be turned on and the lights to the room turned off. In order to prevent photocleavage of DNA, samples are protected from light the whole time. If there is no dark paper, a dark fabric can be used as well. If the DNA does not move, make sure the wires are connected to the box and the run button has been pressed. In the morning, take the gel out of the gel box and load the gel into a container that contains ethidium bromide. Ethidium bromide allows us to see the DNA bands under the blue light transilluminator (Figure 2). Other dyes can be used in place of ethidium bromide. A camera can be mounted above the blue light transilluminator to capture pictures of the gel. Depending on the setup, an imaging station can also be utilized. This method can be utilized for any dye that intercalates or stains DNA, not just the TOTO series. Maschmann et al. modified a technique developed by Meng et al. to determine if fluorescently stained DNA could be digested with restriction enzymes24,25. This is the only technique utilized to determine if pre-stained DNA affects restriction enzymes. This method is limited to the restriction enzymes commercially available, unless a scientist has access to other restriction enzymes that are not listed commercially. Depending on DNA, the enzyme chosen should have a discernable DNA band pattern and enough bands (>3) to determine if the DNA molecule is full length. Also, the DNA should be unmethylated if methylation sensitive enzymes are used. If DNA is methylated, then do not use methylation sensitive enzymes. This method is an easy to use way to determine if restriction enzymes can cut DNA molecules at the recognition site stained with an intercalating dye without needing to design primers for a given cut site34. The future applications of this method would be to determine if fluorescently labeled molecules from an experiment were full length by using a restriction enzyme and determining the size of the DNA bands from the digest or to determine the methylation profiles of DNA molecules. Future experiments could also determine if nicking enzymes are affected by the cyanine dyes or other fluorescent dyes. This research was funded by the National Institute for General Medical Science (NIGMS) (5605100122001), a component of the National Institutes of Health (NIH), as well as University of Nebraska at Kearney (UNK) Summer Student Research Program (SSRP), and UNK Undergraduate Research Fellowship (URF). Ethidium bromide Fisher 15585011 Carcinogen; other alternatives are Nancy 520, Gel red, etc. Teague, B., et al. High-resolution human genome structure by single-molecule analysis. Proc Natl Acad Sci U S A. 107, (24), 10848-10853 (2010). Ananiev, G. E., et al. Optical mapping discerns genome wide DNA methylation profiles. BMC Mol Biol. 9, 68 (2008). Zhou, S., et al. Validation of rice genome sequence by optical mapping. BMC Genomics. 8, 278 (2007). Reslewic, S., et al. Whole-genome shotgun optical mapping of Rhodospirillum rubrum. Appl Environ Microbiol. 71, (9), 5511-5522 (2005). Zhou, S., et al. Whole-genome shotgun optical mapping of Rhodobacter sphaeroides strain 2.4.1 and its use for whole-genome shotgun sequence assembly. Genome Res. 13, (9), 2142-2151 (2003). Gupta, A., Kounovsky-Shafer, K. L., Ravindran, P., Schwartz, D. Optical mapping and nanocoding approaches to whole-genome analysis. Microfluidics and Nanofluidics. 20, (44), 1-14 (2016). Kounovsky-Shafer, K. L., et al. Presentation of large DNA molecules for analysis as nanoconfined dumbbells. Macromolecules. 46, (20), 8356-8368 (2013). Kim, Y., et al. Nanochannel confinement: DNA stretch approaching full contour length. Lab Chip. 11, (10), 1721-1729 (2011). Yu, H., Jo, K., Kounovsky, K. L., de Pablo, J. J., Schwartz, D. C. Molecular propulsion: chemical sensing and chemotaxis of DNA driven by RNA polymerase. J Am Chem Soc. 131, (16), 5722-5723 (2009). Lam, E. T., et al. Genome mapping on nanochannel arrays for structural variation analysis and sequence assembly. Nat Biotechnol. 30, (8), 771-776 (2012). Cao, H., Tegenfeldt, J. O., Austin, R. H., Chou, S. Y. Gradient nanostructures for interfacing microfluidics and nanofluidics. Applied Physics Letters. 81, (16), 3058-3060 (2002). Gupta, A., et al. Single-molecule analysis reveals widespread structural variation in multiple myeloma. Proc Natl Acad Sci U S A. 112, (25), 7689-7694 (2015). Wu, C. W., Schramm, T. M., Zhou, S., Schwartz, D. C., Talaat, A. M. Optical mapping of the Mycobacterium avium subspecies paratuberculosis genome. BMC Genomics. 10, 25 (2009). Jo, K., Schramm, T. M., Schwartz, D. C. A single-molecule barcoding system using nanoslits for DNA analysis : nanocoding. Methods Mol Biol. 544, 29-42 (2009). Jo, K., Chen, Y. L., de Pablo, J. J., Schwartz, D. C. Elongation and migration of single DNA molecules in microchannels using oscillatory shear flows. Lab Chip. 9, (16), 2348-2355 (2009). Jo, K., et al. A single-molecule barcoding system using nanoslits for DNA analysis. Proc Natl Acad Sci U S A. 104, (8), 2673-2678 (2007). Reccius, C. H., Mannion, J. T., Cross, J. D., Craighead, H. G. Compression and free expansion of single DNA molecules in nanochannels. Phys Rev Lett. 95, (26), 268101 (2005). Staerk, D., Hamed, A. A., Pedersen, E. B., Jacobsen, J. P. Bisintercalation of homodimeric thiazole orange dyes in DNA: effect of modifying the linker. Bioconjug Chem. 8, (6), 869-877 (1997). Spielmann, H. P., Wemmer, D. E., Jacobsen, J. P. Solution structure of a DNA complex with the fluorescent bis-intercalator TOTO determined by NMR spectroscopy. Biochemistry. 34, 8542-8553 (1995). Carlsson, C., Jonsson, M., Akerman, B. Double bands in DNA gel electrophoresis caused by bis-intercalating dyes. Nucleic Acids Res. 23, (13), 2413-2420 (1995). Kundukad, B., Yan, J., Doyle, P. S. Effect of YOYO-1 on the mechanical properties of DNA. Soft Matter. 10, (48), 9721-9728 (2014). Technologies, L. The Molecular Probes Handbook: A guide to Fluorescent Probes and Labeling Technologies. 11th, (2010). Riehn, R., et al. Restriction mapping in nanofluidic devices. Proc Natl Acad Sci U S A. 102, (29), 10012-10016 (2005). Meng, X., Cai, W., Schwartz, D. C. Inhibition of restriction endonuclease activity by DNA binding fluorochromes. J Biomol Struct Dyn. 13, (6), 945-951 (1996). Maschmann, A., Kounovsky-Shafer, K. L. Determination of restriction enzyme activity when cutting DNA labeled with the TOTO Dye family. Nucleosides Nucleotides Nucleic Acids. 1-12 (2017). Biebricker, A. S., et al. The impact of DNA intercalators on DNA and DNA-processing enzymes elucidated through force-dependent binding kinetics. Nature Communications. 6, 7304 (2015). Gunther, K., Mertig, M., Seidel, R. Mechanical and structural properties of YOYO-1 complexed DNA. Nucleic Acids Res. 38, (19), 6526-6532 (2010). Zhou, S., et al. A clone-free, single molecule map of the domestic cow (Bos taurus) genome. BMC Genomics. 16, 644 (2015). Ray, M., et al. Discovery of structural alterations in solid tumor oligodendroglioma by single molecule analysis. BMC Genomics. 14, 505 (2013). Chen, S., et al. Genome sequence of the model medicinal mushroom Ganoderma lucidum. Nat Commun. 3, 913 (2012). Zhou, S., et al. A single molecule scaffold for the maize genome. PLoS Genet. 5, (11), e1000711 (2009). Sischka, A., et al. Molecular mechanisms and kinetics between DNA and DNA binding ligands. Biophys J. 88, (1), 404-411 (2005). Lee, P. Y., Costumbrado, J., Hsu, C. Y., Kim, Y. H. Agarose gel electrophoresis for the separation of DNA fragments. J Vis Exp. (62), (2012). Zipper, H., Brunner, H., Bernhagen, J., Vitzthum, F. Investigations on DNA intercalation and surface binding by SYBR Green I, its structure determination and methodological implications. Nucleic Acids Res. 32, (12), e103 (2004).